The prices at Kedai Kopi Hong Seng are incredibly reasonable and the portion size are huge. 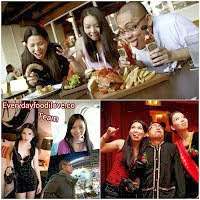 It is a place frequented by Everyday Food I Love's team as they always served consistent tasty food. If you are dining alone, the variety of ala-carte dish available on the restaurant's menu will never let you down. Few of our personal's favourite dishes included the Bittergourd, Chicken Chop, Sweet and Sour Fish and Wat Tan Ho. Every single dishes had its own unique taste and its never failed to keep us satisfied.